Turckheim, France. Several times a day, when I look out the window, I see people taking pictures of my house. This half-timbered 18th-century building, painted a mustard yellow that is popular in northeastern France, is decked with a grapevine and window boxes bursting with geraniums. It looks like the kind of house where a gingerbread man might live. During the four weeks that my husband, Ken, and I have occupied it, we have become very proprietary – so much so, that we call this our house, even though it really isn’t. The house belongs to a young French couple, who spent three years renovating it before work obligations took them to another locale. So they now rent their little dream house through the sharing economy. I came across it when looking for a place where we could spend the month of September and get a taste of life in rural Alsace. This region of the country, with its mountains and vineyards, was largely destroyed during World War II and has since been rebuilt. For the tourist, there are quaint towns with cobblestone streets, several of which are listed among the most beautiful villages of France. Sadly, some of them, such as Eguisheim and Kaysersberg, now so closely resemble tourist-trap theme parks, that it is difficult to find any signs of local life. 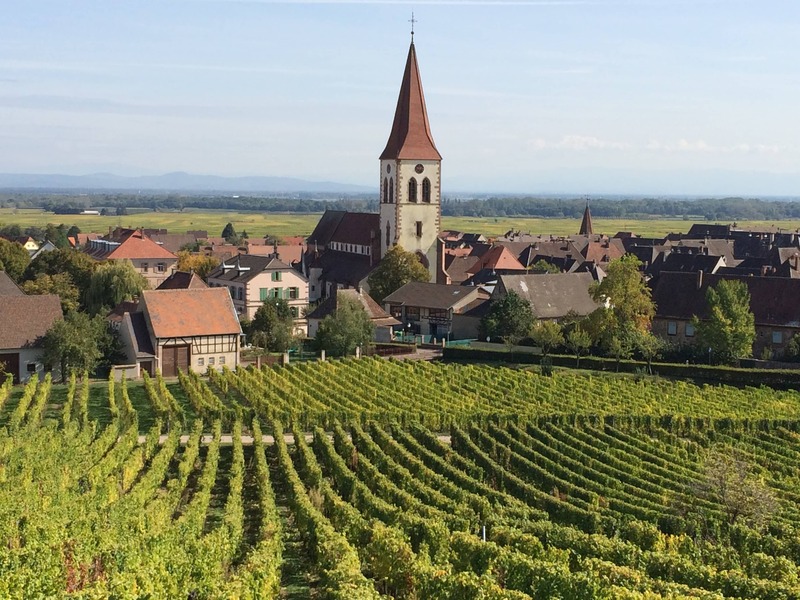 Turckheim, as a Belgian traveler observed when I described it to her, is far more authentic. From the medieval part of the village, where we are now living, parents hurry their children off to school. On my way home from the nearest of two boulangeries, I clutch a warm loaf of bread to my chest to ward off the early morning chill. Then I eavesdrop on a woman who hangs out the window, gossiping with a neighbor in the narrow street below. Later in the day, I can hear the squeals of children playing — it is recess time at school. In the afternoons, as they ride past me on their bikes, they call out “Bonjour!” – a courtesy that youngsters are taught from the earliest age. In the evenings, there are smells of wood fires, and cooking sauerkraut – a sign of this area’s strong German heritage. As I write this post, sitting in the garden behind our house, a noisy chickadee chatters on the roof. The gentle chiming from the clock tower at the end of our street reminds me that it is almost time for dinner. On Friday mornings, I shop at the weekly outdoor market, where merchants have come to recognize me as the foreigner who cooks. When I ask for ripe tomatoes to make into a pasta sauce, they carefully choose the ones that are just right for the purpose. One day, when I arrive home, I find a fresh bunch of parsley stuffed into my market bag – gratis. The next week, after piling in my purchases, the merchant steps out from behind the counter, gently puts the heavy bag over my arm, and pats me on the shoulder as I wish him “bon weekend.” No doubt my conversational French is littered with grammatical errors. But with such gestures they give me an “A” for effort. Being able to experience the rhythms of daily life in this village has been one of the great joys of visiting Alsace. Here are other ways to get beyond the façades. Take a DIY wine tour. In the fertile area between the Vosges Mountains and the Rhine River grow seven varieties of grapes. The harvest, which takes place during the month of September, is the essence of Alsace. Sure, you can book a wine tour, but why not surrender to serendipity? 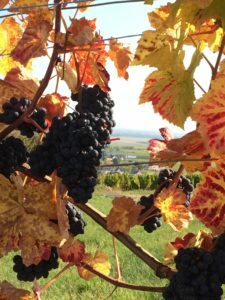 One can easily observe the vendange, or grape harvest, by driving up and down the Route des Vins, a two-lane road that extends for 105 miles from Marlenheim in the north to Thann in the south. Another way to watch the activity is on foot, by hiking through the vineyards adjacent to many towns and villages. Depending on the time of day, one might see the vendangeurs (grape pickers) moving rapidly through the fields with their red-handled shears, or spread out for a picnic lunch. My favorite itinerary is an easy hike that starts in the village of Niedermorschwihr. If driving, leave your car in the small parking lot near the traffic light (there’s only one) at the edge of the village, along the rue des Trois Épis. (The name, “street of the three ears,” is a reference to the three peaks of the Vosges Mountains visible in the distance.) From there, follow the trail markers first toward Katzenthal, and then Ammerschwihr. When you reach the edge of the forest, turn around and head back the way you came. As you leave Niedermorschwihr, vineyards stretch out in all directions. Where the mountains end, you can see the Colmar plains, the city of Colmar and the Rhine. Autumn In the Alsatian vineyards. 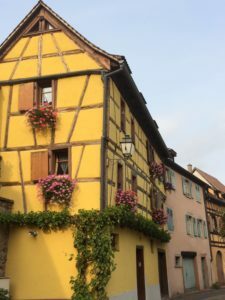 Our vendange hike is an adaptation of one detailed in Promenades et Randonnées aux environs de Colmar – a package of 12 circuits, including maps, available for €6 (about $7 at the current conversion) from the Colmar tourist office. But our exploration of the region turned up many other options, charted by the Club Vosgien – a group of local hiking enthusiasts. One need only look for the trailheads that lead up into the vineyards, from the villages situated in the valleys below. By following the signs it is possible to hike from village to village – for example, between Ammerschwihr and Kaysersberg – or just far enough to appreciate the view. One way to identify vintners whose wines you may like is to order the house wine at a restaurant or wine bar. These establishments make their selections carefully; they don’t want a reputation among local customers for serving swill. This approach led me to the Jean Becker cellar in Riquewihr, where I bought a carton (six bottles) of their least expensive Riesling (€7.60, or about $9 per bottle). The label on this one didn’t say where the grapes come from. And I couldn’t tell the difference between it and the progressively more expensive Rieslings, from the slopes of Hagenschlauf, Lerchenberg, Kronenbourg and Schoenenbourg. Most of my tasting took place at the Cave de Turckheim, a cooperative of local grape growers up the hill from our house. The parking lot there was always filled with travelers from all over Europe, buying huge quantities of wine. And their “Cave Tradition” Riesling (€33.60, or about $40 for a carton of six) became my house wine for the rest of our time in France. Lunch like a local. The goal here is to get away from establishments that cater to tourists and eat at a place where you are likely to see French people on their lunch break, some of them enjoying a quiet meal alone. We found such a place in the village of Illhaeusern. This was not the Auberge de l’Ill, a popular three-star Michelin restaurant where lunch for two can easily run several hundred dollars. 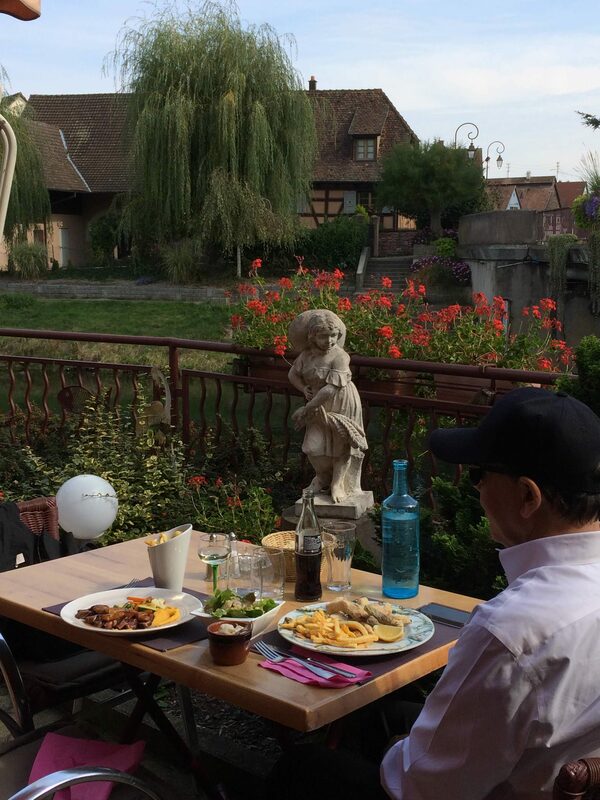 Instead, we favored A La Truite Restaurant, on the other side of the Ill River. The lunch special at A La Truite, consisting of an appetizer (in France it’s called an entrée) and main course (a plat), is fixed at €11.70 ($13.79). A glass of their refreshing house Riesling (the one I ultimately bought at Jean Becker) will set you back another $4. The first time we ate there, I ordered the choucroute (sauerkraut cooked with sausages and other salted meats), which was the lunch special that day and was enough to feed two people. Ken enjoyed the fried carp filets with frites – a regional specialty – which is essentially an Alsatian sendup of fish and chips (the small pieces of fish are lightly dipped in semolina flour). Lunch at A La Truite Restaurant in Illhaeusern. When we returned two weeks later, to celebrate my birthday, it was warm enough for us to sit outside on the terrace, overlooking the river. I ordered magret de canard, or duck breast, cooked with quetsche – an oval-shaped Alsatian plum that happened to be in season. As we finished off the meal with a slice of quetsche tart, a stork flew overhead. The total for this superb meal, in an idyllic setting, came to about $60, including beverages. Visit the Colmar Pocket museum. Even if you aren’t a military history buff (and I’m not), you can’t begin to understand this region without at least scratching the surface. Alsace was annexed by the Nazis in 1940, and for nearly five years, it remained under their control. Then, six months after the Normandy Invasion, which began in June 1944, Hitler’s troops battled the Allies for possession of Alsace during an especially harsh winter. This was the Battle of the Colmar Pocket – a brutal, three-month military campaign from November 1944 to February 1945. The Musée Mémorial des Combats de la Poche de Colmar tells the story of that battle, as I wrote here. Load up at farm stands. During the harvest, this is a colorful and economical way to buy seasonal produce right from the source. One of our more memorable stops was at La Pommeraie, along route D10 (the Route des Vins) between Bennwihr and Ingersheim; noticing a full parking lot, we pulled in. The shopping carts there are fruit crates attached to wagons. On the late September day when we visited, customers were filling them with enormous bags of apples, and bottles of apple juice and hard cider. Posted signs above the gargantuan bins of fruit being brought in by forklift indicated that the apples would last for three months, and encouraged customers to put away enough for the winter. We shopped for our remaining time in France. A quick swipe of the Collins French-English, English-French dictionary app on my iPhone helped us identify the apples that would be best for that purpose: A small Gala variety was labeled à croquer, which means “to munch.” It fits easily in the hand and is just the right size for a snack. If your favorite fruit has already gone out of season, the wide selection of homemade preserves is a great consolation prize. We grabbed a jar of Mirabelle jam for the road. Follow your nose to the boulangeries. Life in a French village revolves around the bread store, where crusty loaves come out of the oven several times a day. Often there’s a short-term parking zone in front, leaving time to pull up for 15 or 20 minutes, run in, and make your purchase without having to feed a meter. In many cases the boulangerie does double duty as a pâtisserie, which means it also sells cakes; these may be baked on the premises or come from a local supplier. Wherever I go in France, I gravitate toward boulangeries that are busy. It’s not only a sign of quality, but it also gives me a chance to watch what people ahead of me in the queue order. The German influence on Alsace – the region changed nationalities five times in the space of 150 years – has become baked in. So in addition to the usual baguettes and cereal breads, there are offerings like beer bread, and a dark pain de campagne (country bread) that is about four feet long; you indicate about how much you want, and the server carves off a hunk and weighs it. Soft pretzels are so iconic that they are part of the logo of Tourism-Alsace, the local tourist organization, but seem to be eaten mostly by tourists. Ken, a Philadelphia native and soft pretzel connoisseur, gave a big thumbs-down to all the ones we tried, saying they were bland and tasteless. It took only a few days for me to become a regular at one of two boulangeries in Turckheim. I knew that I had made the cut, as it were, when the server refused to sell me my standing order for longuets au sel (a flaky rendition of salt sticks). There was a fresh batch in the oven, she said, and suggested I come back later. Here I am living in Barcelona with much of the charm of makes, wine and culture. Yet your writing lures me to the French countryside. Thank you! . . .And I am thinking of Barcelona, wondering about the safety of people like you who are living there. What is it like day-to-day?